Bank of Hawaii’s social media activities were ranked among the top 30 U.S. banks by The Financial Brand’s “Retail Banking Social Media Power 100” list. In a separate category, Bank of Hawaii also placed within the top 100 banks worldwide for social media. The list evaluated banks on their level of social media engagement, and measured Facebook “likes,” highest Facebook engagement rate, most Twitter followers, most tweets sent, most Twitter accounts followed, most YouTube video views and most YouTube subscribers. Bank of Hawaii was the only financial institution in Hawaii to be ranked within the top 100 in any category. The “Retail Banking Social Media Power 100” list is a joint production between The Financial Brand and Social Media Explorer. The Financial Brand is an online publication focusing on branding issues and advice affecting retail banks and credit unions. Social Media Explorer is an industry-leading blog and publishing platform for digital and social media marketing, online communications, public relations and advertising. 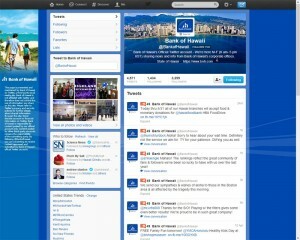 Bank of Hawaii launched its social media presence one year ago. Its Facebook page, Twitter profile, and YouTube channel are featured on the bank’s webpage. The bank was the first in the state to offer its customers online banking services, and the first in the state to offer mobile banking, including an app for Android and iPhone users. In addition, Bank of Hawaii recently launched a new iPad app, making banking even more convenient for its customers across the state, Guam, Saipan and Palau.